All kids come with their own idiosyncrasies. Well, my almost-10-year-old daughter is the one of my children who seems to have inherited my husband’s trouble sleeping. She is the one we have to keep a really close eye on and make sure we intervene at the first sign that she isn’t sleeping well. This past summer, my daughter was definitely getting behind on sleep, with early morning swim practices and staying up late for swim meets and family movie nights. Our end-of-summer vacation with cousins really finished her off. By the end of our trip, she was an emotional, bleary-eyed mess, unable to enjoy her days fully because she was so tired. If you’ve ever had even one night of poor sleep, you know how it can affect your mood, your ability to focus, and your energy level, amongst other things. Luckily, I’m a mommy veteran and have tricks up my sleeve that got her back on sleeping track once we returned home. These child sleep remedies and tips will help you turn things around if you should also find yourself with a child who is not sleeping well. Hopefully, it will save you some of the trial and error that I have gone through over the years. The first thing to do is to make sure you know how much sleep your child should be getting each day. This changes as they grow, so always double-check that first. The guidelines from the American Academy of Pediatrics are listed below. Take a look at your daily schedule and think about whether your child has enough time to get the recommended hours. Move up bedtime if you need to, and work to protect those hours that are supposed to be for sleeping. There are several easy adjustments that you can make to the room your child sleeps in to make it a place where good sleep can happen. 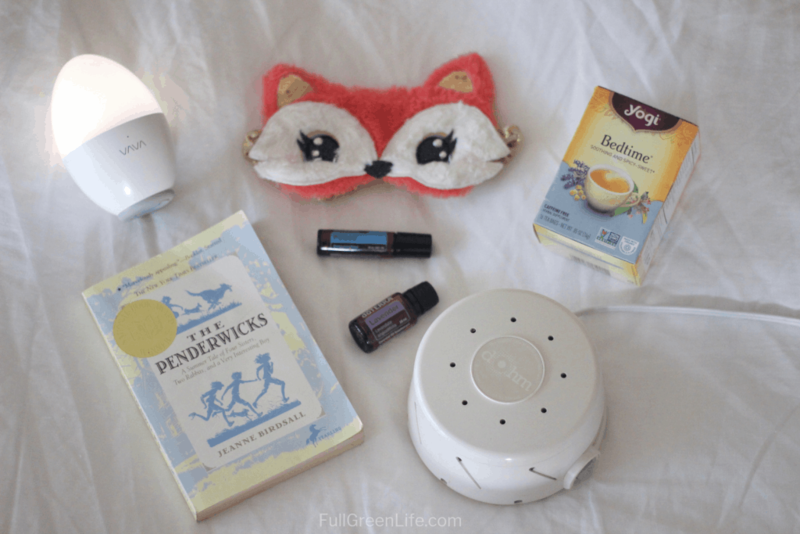 If you are not a person who ever has trouble sleeping, these ideas may seem simple. They are! But, for someone who struggles with sleeping, these easy changes can be the difference between a good night of sleep and a poor one. Changes to the sleeping environment fall into three categories: Light, Temperature, and Noise. A dark room is best for sleeping. Light and darkness help trigger the body to feel awake or sleepy. This means that if a room has too much light, it can be stimulating and disruptive for your child’s sleep. There are several ways you can reduce the light for your child during sleep. Blackout curtains These will help significantly to decrease light coming into the room from streetlights, lightning, or a full moon. They are also helpful if it’s still light out at your child’s bedtime, or if the sun rises before your child should be awake. We use these in all the bedrooms in our house, and we love them. When you’re purchasing and hanging your curtains, try to make sure the curtains extend at least 4-5 inches beyond the edges of your window in order to keep the bright light from pouring in around the edges. Eye mask This is helpful to block any ambient light in the room, like that coming from a clock or under the door. It can also be a good solution if your child shares a room with a sibling who needs a night light or has a later bedtime. 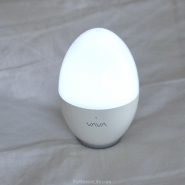 Dim/No nightlight Not using a nightlight is ideal for good quality sleep. That being said, I’m a mom and I myself have more than one child who is unwilling to try going without one. In this case, you can be strategic about where you place it. Placed on the other side of a dresser or other piece of furniture from the bed, the bright, direct light can at least be blocked from your child. Cover or turn the alarm clock If you have a lit clock in your child’s room, turn it away from your child while they sleep, cover it with a blanket to darken it, or better yet, replace the clock with a clock that does not have a light. When we fall asleep, our bodies drop in temperature as part of the falling asleep process. This drop in temperature is one of the factors that helps induce sleep. If a room is too hot (or too cold), it makes it harder to keep that “sleep body temperature” maintained, which makes it more difficult to fall asleep and to stay asleep. An ideal sleep temperature for kids, according to many experts, is around 70-75ºF. It’s even cooler than that for adults! There are a few ways to help keep your child at a comfortable temperature for sleeping. Cool bedroom If you have a programmable thermostat, set it to drop at night so that is within the target range. At our house, we program it to our sleep temperature a half hour before bedtime so that by actual bedtime, the rooms are nice and cool. Layered bedding Having a few layers on your child’s bed, instead of one thick one, will allow them to use what they need to feel comfortable. Bath or shower right before bed After taking a warm shower or a bath, your child’s body temperature naturally drops back down to normal. I have found with my children (and even for myself), if I time this for right before they climb into bed, it helps them fall asleep faster. Ceiling fan If you have a ceiling fan in the room where your child sleeps, try having it on low and rotating so that it is pulling the air up toward the ceiling. This keeps the air flow in the room circulating without blowing on your child. It will also keep the room temp more even throughout the room. Making adjustments to keep household noises from disrupting your child’s sleep is obviously an important part of setting the stage for a good night’s sleep. I find this to be the biggest issue in our house with 2 adults, 2 teenagers, a big kid, a toddler, and a dog. Here are the ways we overcome the noise factor at bedtime. Bedroom doors closed “Just a crack” was our rule for a long time. But as our household has grown, so has the noise level. With the bedroom door closed all the way, our younger children are able to be in their peaceful spaces without being so easily disturbed by what older siblings are up to in the rest of the house. Door draft stopper You know those little stuffed snake-looking things that go under doors to prevent drafts? Well, those are also really useful for blocking noise from traveling through the crack between the bottom of the door and the floor. In our house with concrete floors, closing this space really helps keep the bedrooms quieter. Stagger bedtimes with sibling roommates If you have two or more kids of different ages that share a bedroom, it can be tricky to get the younger one to sleep when the bigger one is in there as an enticing distraction. Staggering their bedtimes by at least half an hour will help give the younger one time to fall asleep first. Usually, the older one will be more able to be quiet when going to bed and not wake the little sib. White noise Some people have trouble falling asleep when it’s perfectly silent. In this case, or in the case of a noisy household or sibling roommates, white noise is the answer. It’s simply a steady, sound that is capable of masking other noises that may be disruptive during sleep. 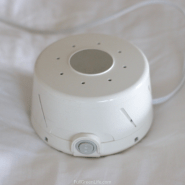 To bring white noise into your child’s bedroom, two good options are to use either a fan or a sound machine. I have found that it can be difficult to find fans that are noisy enough to use as white noise since quiet operation is normally a selling point. One fan that we have found that produces a decent amount of “whirring” noise is the Honeywell Turboforce fan. I sometimes would like it to be louder, though. Another one that I would recommend is the Lasko one pictured to the right. I don’t have personal experience with it, but has great reviews and users say it gets loud—just what we want! We have used sound machines for all of our children from infancy. The sound machine on the left is the one we use and what I consider the absolute best. It is an actual fan inside the round housing. It has two speeds, and by twisting two separate pieces of the housing in different directions, you close/open different combinations of holes. This changes the frequency of the sound you hear, so you can adjust it to whatever you or your child prefers! Important Note: If you choose a sound machine with an artificial/recorded signal, one that is part of an alarm clock, or one that is on an app on your phone, please make sure you do not make the volume too loud. It is certainly possible to cause hearing damage if you blare it, just like with music or any other loud noise. A lot of parents establish bedtime routines for their kids as babies. As kids grow older, sometimes these routines end up being shortened or even abandoned. We are definitely guilty of this at our house. But the fact is, we can all benefit from a routine at bedtime. It allows your body and your mind to begin to wind down in a peaceful, predictable way so that once you are in bed, you will be ready for sleep. There are a lot of different things that you might want to incorporate into your child’s bedtime routine. It can be short, long, simple, or elaborate. The important thing is that it’s consistent and predictable. This helps your child take it as a signal to slow it down and prepare for sleep time. Below are some of the things that I have found helpful with my children and that you might like to incorporate in your own child’s routine. Get ready for the next day. Lay clothes out, pack homework in the backpack, make lunch…by getting ready for the next day, you help your child eliminate as much stress about the morning as possible. Avoid vigorous activity and exercise for a few hours before bed if possible. It takes some time after getting your heart rate up to be able to get back to a relaxed state. Sticking with low-key activities for a couple of hours before bedtime will make it easier for your child to get to sleep when it’s time. I know you can’t choose when athletic teams hold practices, so just do what is in your control here and don’t sweat the rest. Limit screens for two hours before bed. That darned blue light that comes from screens is thought to decrease the melatonin your body produces. Melatonin is a hormone associated with sleep. So keeping your child off of electronics and screens before bed is a good idea. Have a cup of tea. My daughter and I both love a cup of Yogi Bedtime Tea before bed. It has valerian root and other soothing herbs in it, and will really help relax your child. If your child doesn’t like tea, try a warm cup of milk. Shower or bathe right before bed. Like we talked about above, having a bath or shower right before bed triggers can help your child’s body decrease in body temperature to help induce sleepiness. Use essential oils. For sleeping, good oils that I recommend include lavender, cedarwood, dōTERRA Serenity, vetiver, and dōTERRA Peace. You can either diffuse these in your child’s room, or make a rollerball and apply to their wrists, back of neck, and bottoms of feet. Incorporate some reading time. 15-30 minutes of some quiet reading in bed can be relaxing, and of course, reading is always a great activity for kids. Just make sure what your child is reading at bedtime is not too riveting! Harry Potter books, for example, have been known to keep children at my house up until the wee hours of the night! Play them a progressive meditation recording. There are some great ones available through Alexa devices. We are currently experimenting with this with my daughter. We got her an Echo Dot for her birthday with this in mind. I will report back with specifics! Valerian Super Calm. This one is my last-ditch effort if I have a child who really can’t sleep and desperately needs it. Valerian Super Calm is an herbal remedy for kids that was recommended to us by a pediatric naturopath. It contains valerian root and is formulated for children. Please run it by your doctor first. 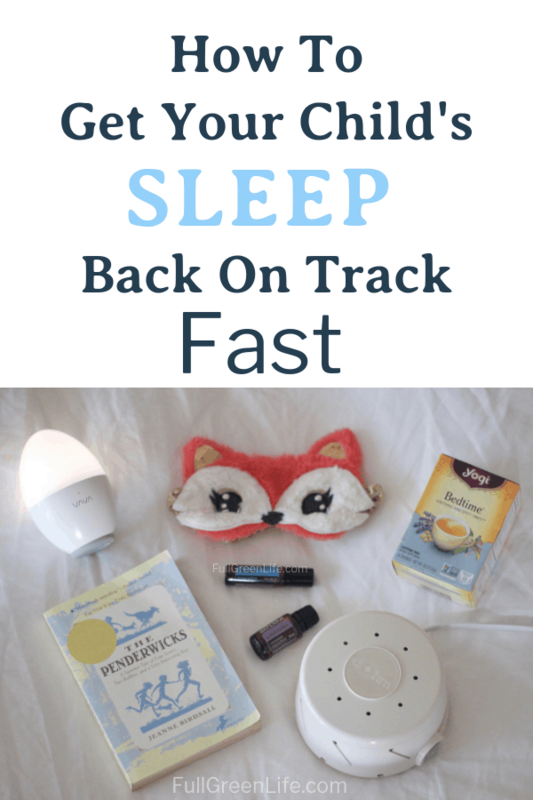 We have had really good results using it when our kids are in a bad sleep cycle. Whatever you choose for your child’s routine, be sure to start the process with enough time before their bedtime to get them all tucked in on time. By knowing how much sleep your child needs, creating the ideal sleep environment, and putting together a bedtime routine that suits your child, you will be on your way to getting your child’s sleep back on track! *Please note that I am not a doctor and if you have medical concerns or questions, you should ask your doctor. This post is not intended to provide any medical advice and should be used for informational purposes only.